/ ($ | £ | €) 15 CASHBACK for every ($ | £ | €) 100 spent! For all purchases made at our online shop www.equishop.com from May 18th to May 27th you can gain up to ($ | £ | €) 15 CASHBACK for each ($ | £ | €) 100 (depends on which currency you use) you spend. We'd love to invite you to get aquatinted with terms and conditions presented below. - order value ($ | £ | €) 95 = NO CASHBACK! 3. The only requirement you have to meet to get CASHBACK is that you have to agree to receive our newsletter. How can you do it? Please check the instructions below terms and conditions. When you agree to receive our newsletter, at the same time you agree to forward your e-mail address (optionally with your first and last name) to Freshmail Sp. z o.o., Al. 29 Listopada 155 c, 31-406 Kraków, Poland. Freshmail company is the newsletter service provider. Your consent to receive Equishop's newsletter may be withdrawn at any moment by clicking the resignation link, which we always include in our newsletters or by sending an e-mail address withdrawal from the base to db@equishop.com. Please remember thay the e-mail address for the newsletter must match the e-mail address used while placing an order at www.equishop.com. 4. CASHBACK will be sent to your e-mail address to May 30th 2018. 5. The CASHBACK discount voucher will be valid until August 31st 2018. After this date it will become void. CASHBACK will give you discount on the whole product offer at www.equishop.com, but it won't combine with other discount vouchers. The discount will be valid only for the e-mail address it was sent to. 6. In the case where the above-mentioned conditions were met and you didn't receive the discount, please inform us at db@equishop.com and we will try to solve this issue. HOW TO AGREE TO RECEIVE OUR NEWSLETTER? 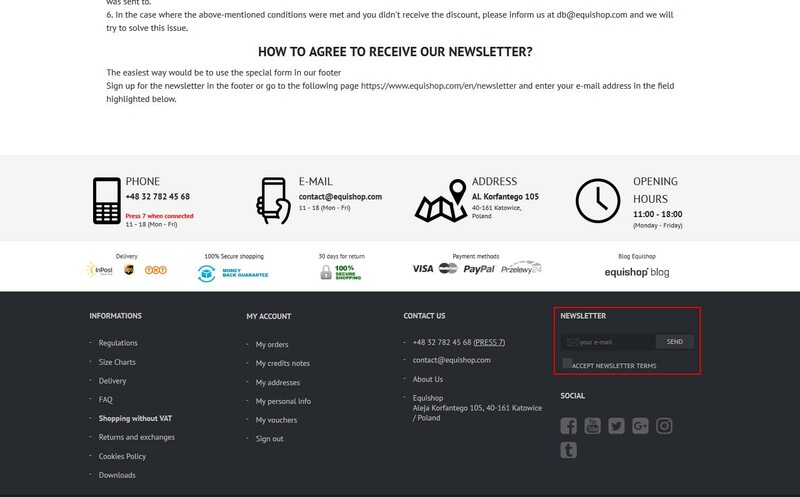 Sign up for the newsletter in the footer or go to the following page https://www.equishop.com/en/newsletter and enter your e-mail address in the field highlighted below.